All Seasons was started in 1970 in Langdon, North Dakota by Dieter and Georgia Heitmann. It began as a retail greenhouse called the Langdon Garden Center. Construction at the current location began on September 17th, 1978 when a pond was dug out to build up the building site. Construction on the main greenhouse was completed in the spring 1979, the size was just under 14,000 square feet. In the summer of 1980, construction began on the main showroom, garden store, gift shop, floral department, garage and work areas totaling 6,400 square feet. The store's front door arrived just before the Christmas selling season. Dieter and Georgia, along with their daughters, Jan and Jill, have been filling pots, caring for plants, tending to the nursery and many other aspects of the business for over 40 years. Jill's husband, Scott, along with their three sons, Jacob, Adam and Nicholas, have also been a great addition to the family business. Together, they take pride in their customer service and quality of products. "Every year we make a trip up north to visit this greenhouse, back home they do not have the kind of plants we are looking for. We load up the car and drive straight back home! It's really fun!" 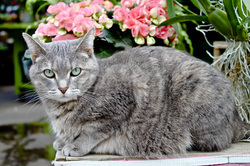 Snickers is our mouser whose moods can range from ultra friendly to a little feisty. She likes to ride around on people's shoulders, sleep on the warm copier and keep watch around All Seasons. 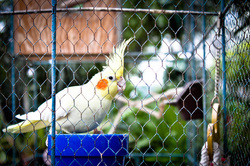 All Seasons has three cockatiels that live in the greenhouse. They love watching shoppers go by. 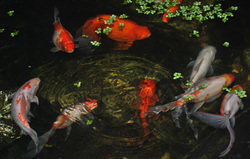 Just inside the main greenhouse is a fish pond with our many colorful koi and gold fish! They are a favorite among our youngest shoppers!